Note Date: 04/3/2019 - Great News! Bishop Daniel Conlon ordained Br. Ramon Sida to the Order of Deacon. ​Congratulations to Deacon Ramon Sida, III! Dc. Ramon knows signing very well. He has been attending to our Deaf Community events like our retreats, Christmas Party and being in St. Mary Immaculate for pastoral internship. He will become a priest in one year. Here is the pictures taken from St. Raymond Cathedral in Joliet. Please read Fr. Joe's letter about Lent 2019. Press this button to read his letter. Do not throw any of your prescription or over-the-counter medicines down to the toilet or garbage! Please check with your village's website or garbage collector's website for how to get rid of prescriptions and over-the-counter medicines. For example, where I live in Carol Stream, there is a medications drop-off box in the lobby of the Police Department. Free Drop-off! ​Please do this for keeping our land and water safe. Last June 27th, Chicago's Deaf had their great experiences to meet Pope Francis. See an article from the Chicago Catholic News. See the picture of Raymond Gay signed with Pope Francis. Raymond Gay was our former President of ICDA Chapter 46. Note Date: 09/11/2018 - First Deaf Astronaut at NASA!!! Wow! That is so cool!!! NASA's First Deaf Astronaut... See the news... Go for it, Julia! Many thanks to the Minooka Knights of Columbus for the donation of $547.32 to our Deaf Apostolate of the Diocese of Joliet. John Sefcik, Diana Stallings, Richard Kush, Raymond Gay and Julie Rueb attended the Knights of Columbus Dinner and accepted the donation from them. Here is an interesting article from The Herald-News. The show "13 Reasons Why, season 2" is a very controversial show. It involves the issue of teens thinking about killing themselves. The NCPD is not an anti-young people, anti-let's discuss hard issues organization. their mental health staff are very experienced and balanced. I would suggest downloading the PDF provided for help for you and your family. There are a number of resources available on the web for families, clergy, pastoral ministers, educators, and other caring adults to utilize in learning about the series, how to respond in working with youth, and other important factors and issues. Click on the image below for the PDF to discover them and more information. Holy Trinity School for the Deaf in Chicago is an excellent program for the Deaf and Hard-of-Hearings students. It have been around since 1957 and still continue on. Watch their video about their school programs. Our member of ICDA Chapter 46, Brian Van Thyne, is an ICDA United States Section Treasurer. He wrote up about himself and his beautiful family in The Deaf Catholic magazine, Spring, 2018. ​Press this button to read his profile. Congratulations, Brian! 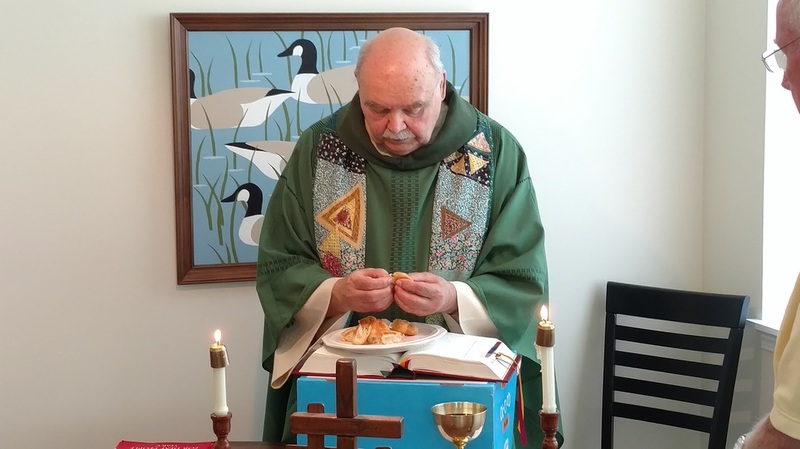 We all do believe that the Eucharist is the true Body and Blood of our Jesus Christ and that our sharing in the Eucharist is the sign of our unique Faith. The Church invites you (Catholic) to receive Holy Communion. If you can not receive Communion, you can still come forward for a blessing... by using this approach, when you request for a blessing, simply cross your arms over your chest. You are welcome to join with us to help our ICDA Chapter. We know that many dioceses are unable to provide a Mass in American Sign Language for Deaf Catholics. In response we are making an ASL Mass available online to watch. Every Sunday at 11:30 am we are livestreaming a Mass in ASL from Holy Innocent’s church in Roseville via Facebook. The Mass can also be viewed as a replay on Facebook anytime afterwards. Attendees do not need to register on Facebook to “attend” this Mass, but it is a great platform for us to evangelize the gospel. The Mass can be found at the following web address if you are interested: https://www.facebook.com/deafmass. Please share this news with the Deaf Catholic community in your area especially those who are not able to go to church due to health issues, etc. Because this is still a new project, we appreciate your patience and understanding with our mistakes and glitches in our videos or Facebook page. We are trying to make improvements and we welcome your feedback and suggestions. Come and see what we are about and feel welcome to add your ideas and suggestions. Your ideas can enhance and improve our spiritual and social union among deaf and hard-of-hearing Catholics throughout the seven counties of the Joliet Diocese. There are couple of more events and retreats in Events/Retreats tab. Also, Check the Pictures Tab, too. Two officers of our non-profit ICDA Chapter No. 46: Diana Stallings (left) as the Secretary and Pamela Seymour (right) as the Treasurer receive awards. The Outstanding Achievement Award goes to Diana who had the capability to do job as writing, business correspondence, accumulation of historic records, arrangement in the proper order, accuracy and other responsibility. She did a great job through four years. The Thank You Award goes to Pamela who had been very good responsible to take care of all the finance records and money through four years. The Certification of Appreciation is awarded to Diana Stallings who had a great performance, spiritual ambition, leadership, encouraging cooperative effort and continuously energetic active. And had awesome creative artwork, design for the formal business letters, forms and also had an importance of skillful writing and other various skills. Additionally Diana makes many announcements to send out to the members of the ICDA Chapter 46 by using electronic emails at Internet, she still continues and has a wonderful humbly patience; nevertheless, still enjoys job. If without her, it would never have been improved successfully. 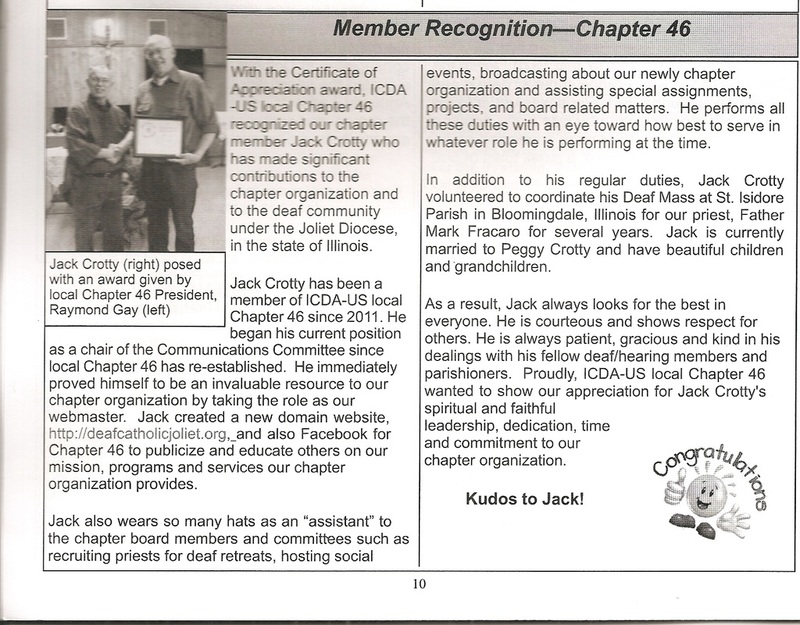 The members and I are so deeply grateful to them for their four years of service and continued support our ICDA-US Chapter No. 46. Many thanks! This means that a hospital cannot give out ANY information about a patient in the hospital, without the patient’s permission. So, often, a visitor goes into the hospital, hospital won`t tell him/her what room your love one in. After the patient leaves the hospital, he/she complains that no priest or no deacon came to visit them! Priests/ Deacons/Others did not come because the hospital never told them! Note Date: 05/04/2014 - Great News... Two Popes became Saints!!! - be able to use our own languages to understand the Mass (used to be just Latin). - disable person can became priest like Fr. Tom Coughlin, Fr. Mike Depcik, Fr. Paul Z. and many others. Pope Saint John Paul II was a great, beloved and respected Pope. One time, there was a nun who had Parkinson Disease, she was praying to Pope John Paul for healing... got surprised that she was healed. The Vatican declared him Saint. Note Date: 07/02/2015 - New Concealed Gun Law! Since Illinois State Law is allowing people carry a concealed gun around. Please do not bring guns to any churches or schools at all. You have a right to tell them not to come in your home with gun. State Police have a signed post you can post it on your doors. If you have any information you like to place in our website.